It is a contradiction of terms when you say the biggest success a scheme can have is not to be needed anymore, but that is exactly the case with the Chelsea Asian Star initiative. The event is aimed at addressing the lack of Asians in the English game and invites 400 children to the club's state-of-the-art training facility in Surrey on an annual basis to put them through their paces. The initiative took place for a sixth time earlier this week and there was no lack of interest from the Asian community, with most in attendance coming from a Bangladeshi, Indian, Pakistani or Sri Lankan heritage. Chelsea say seven previous winners have gone on to join the academies of other professional clubs, and head of the Chelsea Football Foundation Simon Taylor rejects claims the scheme is a publicity stunt. He calls it a "labour of love", adding that there are easier ways of "generating PR", and coaches and staff give up their bank holiday to help run it. "Hopefully, in a few years when there is a bigger population of Asian footballers coming through the academy and grassroots system, we won't need a programme like this and then we'll all be very happy," said Taylor. The 2011 census revealed that Asians made up 7.5%, - or about 4.2 million people - of the population in England, although there are only eight British-born players from this ethnic group with professional contracts in the country's top four professional divisions. The Football Association is also trying to tackle the issue as it continues to put together its delayed British Asians in Football plan and gave a talk during the event on ways this ethnic group can get involved in the game. The Chelsea Asian Star day starts by putting British Asian kids at Under-9, U10, U11 and U12 level through their paces with a series of fitness and skill tests before matches take place on the pristine grass surface at Cobham under the watchful eye of the Premier League side's coaches. 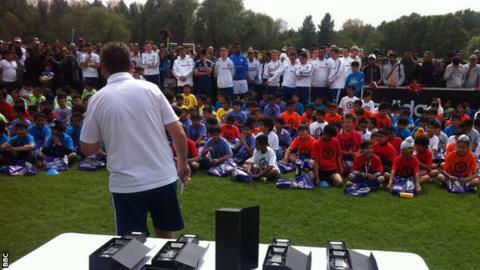 The winners of each age group earn a year at Chelsea's Football Development Centres, a step below the club's academy. Those that impress have the chance to make the step up. "The event is demonstrating to the Asian community that opportunities do exist and that they are here at Chelsea, and other clubs as well, but it is also demonstrating to the football world that there is a huge talent base in the Asian community," said Taylor. "You look around and you can see that there are some exceptional players out there. The main aim is to give the kids a fun time and to try to get them involved in football at whatever level that their skills allow them to play at. "It is about breaking down barriers, getting kids into grassroot clubs and providing talent pathways for the better players as well. Hopefully, we are achieving that." On the parental front, it appears the generational integration into English society of Asians is helping dispel the stereotype of education coming above pursuing sporting endeavours. "Of course I would be happy for my child to make a future in football. Who wouldn't be?" said Farida Pandor, who brought her son to the event from Leicester. "It's not the money, it's because he is so into it and really enjoys it. We will encourage him, even if it for his fitness and his own health." Rajinder Rathore, whose son is taking part in the initiative for a second year, said: "It opens doors and then a kid can see whether it is for him or not. "I'd be proud if he made it as a footballer. But you always have to have Plan B so, if you don't make it as a footballer, then you can fall back on your education." Siraj Khalil travelled from Birmingham to attend. "This generation of parents understand the country and culture as well as the importance of sport so Asian children have every advantage now," said Khalil. "Previous generations didn't even have time for recreation as they were concentrating on work and money. Now Asians have disposable income and time on their hands." "It is also psychological," stated Jas Dhaliwal, a youth secretary at the Khalsa Football Federation, which runs FA affiliated Asian teams from around the UK. "Asian children know they are no different to any other kid whereas past generations might have thought we are slightly different because our heritage doesn't like this." The Zesh Rehman Foundation (ZRF), set up in the name of the former Fulham and Bradford defender, helps to get more Asian coaches into the game and it sent along a number of them to the Asian Star event to shadow Chelsea's coaches to gain valuable experience. "At the foundation we are getting young coaches from all backgrounds, male and female, and giving them the confidence and skill sets so that they can become the role models in the future," said Riz Rehman, operations manager at ZRF. "They can be the ones in the future driving that 'Asians in football' agenda." Sam Khan, 12, is a previous winner of the event in his age group and, while he had to decline the opportunity to join Chelsea, he has been signed by Birmingham. "The prize when I won it was to get an actual trial here with the academy at Chelsea. I went for the trial and the coaches said I did really well and I was impressed with myself," explained Khan. "They were going to ask me to join but I live in Coventry and so I would have had to have moved which was a bit too much so I said no. "They passed my name on to Birmingham City and I had a trial there for a few weeks. I impressed them and they offered me a contract and I have been there for three years." Khan, clearly a determined young footballer, is that rarity, a British-born Asian at a professional club with a chance of making it through to the top ranks. Khalsa's Dhaliwal thinks clubs "are now getting serious about engaging with Asians in football" and that "the situation is improving". "But," he cautioned, "there is still a long way to go." Is English football set for an Asian breakthrough? Read more on Is English football set for an Asian breakthrough?